Forecasters warned that yet another series of thunderstorms was set to pummel North and Central Texas early Saturday morning, a day after flood waters submerged Texas highways and threatened homes across the already storm-damaged state. A squall line stalled over Dallas overnight Thursday, dropping record-setting rainfall and triggering a Flash Flood Emergency in North Texas. The most recent rain added to the damage inflicted by thunderstorms that have killed at least 23 people statewide, including two overnight in North Texas, and left 13 missing. 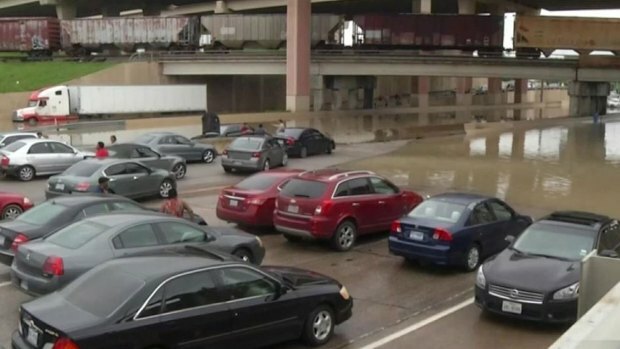 The rain seeped into homes and stranded hundreds of drivers across the Metroplex, many of whom lingered along Dallas' Loop 12 for six hours Friday morning after being gridlocked by high water and abandoned vehicles. Overnight, Dallas Fire-Rescue crews responded to more than 270 calls that included trapped vehicles and crashes, authorities said. The Colorado River could crest in Wharton Saturday, causing major flooding in the community 60 miles southwest of Houston, forecasters said. President Barack Obama signed a disaster declaration amid the severe weather, offering federal funding to affected people in Harris, Hays and Van Zandt counties, the White House said in a statement early Saturday. Texas Gov. Greg Abbott had earlier requested a presidential disaster declaration to get federal help for affected counties. 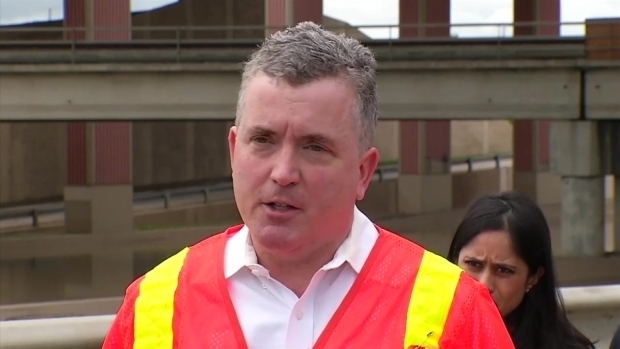 Dallas city and police officials update the flooding situation along Loop 12 near Interstate 30, where water covers the road following hours of heavy rainfall. Mesquite Fire Department Capt. Kelly Turner said a man's body was found early Friday morning after his truck had been swept into a culvert and submerged. The Dallas County Medical Examiner's Office identified the flood victim as 47-year-old John Jeffrey Usfrey. Turner said people stranded on two cars that were also swept off the road told responders about the truck. He said the truck had been underwater for some time before they found it, and that authorities believe the man, whose name has not been released, was alone in the vehicle. In Dallas, police said Friday afternoon the body of a man was found near California Crossing and Northwest Highway as flood waters receded. Police did not release the man's identity, but did say he was not found in a vehicle. Recent storms are being blamed for killing seven people in Oklahoma and at least 23 in Texas, where 13 remain missing or unaccounted for. Thursday's storm, which dropped nearly five inches of rain overnight at Dallas Love Field and more than two inches elsewhere around the Metroplex, helped set a record for the wettest May in Dallas-Fort Worth history. The previous record for May rainfall was set in 1982 at 13.66 inches and was eclipsed at midnight when 13.87 inches had been recorded for the month. By 8 a.m., the total rose to 16.07 inches; 8.62 inches received in the last week alone. According to The National Weather Service in Fort Worth, those 16 inches of rainfall amount to more than 35 trillion gallons of rain. The wettest month ever recorded in North Texas goes all the way back to April 1922 where 17.64 inches were recorded. With more rain expected Friday night and into Saturday, shattering that record remains a possibility. Flooding has blocked a busy highway west of Downtown Dallas, causing major traffic delays in both directions. Overnight rain caused water to pool on Loop 12, under the Interstate 30 overpass Friday morning, trapping commuters for several hours. Overnight rain caused water to pool on Loop 12, under the Interstate 30 overpass Friday morning, trapping commuters for several hours. Some of the drivers said they had been there since 5 or 6 a.m.
Texas Department of Transportation spokesman Tony Hartzel said a crane was brought in after 11 a.m. to remove a section of median so that motorists trapped in the southbound lanes could get off the roadway. The northbound lane had already been cleared. He said the southbound lanes were more challenging because streets where people could have exited were flooded as well. He said they think that the area where the road usually drains to flooded as well, so there was nowhere for the water to go. At 10:20 a.m., Dallas Fire-Rescue spokesman Jason Evans said they had received more than 270 calls for help, most of which were for cars stranded in high water. Evans added there were about 70 crashes reported. "Obviously 'turn around don’t drown' is the phrase of the day," Evans said in a news release. "In addition to turning around, we would encourage drivers to map out at least two alternate routes to where they’re going, that way they don’t feel pressured to put themselves at risk. Better to be late to something than to put yourself in a situation where you just don’t get there at all." 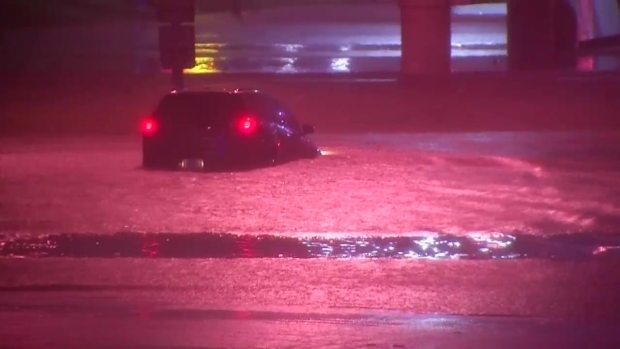 At least seven vehicles are trapped in high water on Harry Hines Boulevard in Dallas after overnight rain makes this the wettest May in Texas history. Evans also reminded drivers that if they see an emergency vehicle blocking a roadway, it's there for a reason and to not drive around it. "While not seeing a warning sign, for high water, can be understood; what’s inexcusable is drivers who drive around emergency and service vehicles to drive into the same high waters from which we are rescuing people," Evans said. Dallas officials are pleading with drivers not to drive around barricades and risk heading directly into flooded areas. An NBC 5 photographer captured video of a driver maneuvering around a police cruiser beneath an overpass on Northwest Highway early Friday and heading directly into high water. Rescue crews used a raft to help that driver to safety after the SUV gave way to the water. "We have a sincere plea with our drivers. If you see a barricade or a sign, please do not try to drive through that area," said Sana Syed, City of Dallas spokesperson. Tarik Hawkins told NBC News he was became stranded while trying to drive to work. He said it took him two hours to drive about a mile and described the situation on the road as "very chaotic." "Right off I-35, there has to be 50 or 60 cars stranded," he said. Israel Ramos, a 32-year-old tower inspector, said there was three inches of water inside his home and the street outside resembled "a river." He told NBC News that his neighbor called police when he saw an SUV floating down the street with a person inside. The American Red Cross opened a shelter at the Tony Shotwell Life Center in Grand Prairie, according to spokeswoman Anita Foster. Supplies should arrive at the center at about 8 a.m.
Arlington police said they blocked East Abram Street near Texas 360 because of major flooding over the roadway. Residents of a Grand Prairie apartment complex were forced to evacuate their homes overnight as heavy rain flooded first-floor units. Authorities also received high-water calls on Interstate 30 near Oakland Boulevard and University Drive, 7200 Wichita Street and Trinity Boulevard near Precinct Line Road. An NBC 5 viewer reported that Walnut Creek in Mansfield is swollen and pushing toward residential areas. Nearby Oliver Nature Park is also reportedly under water and closed. 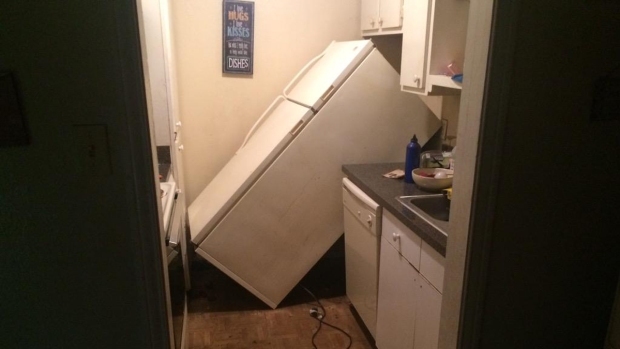 Officials have evacuated or rescued about 19 people, according to Johnson County Emergency Management Coordinator Jamie Moore, but many more could be trapped in their homes. 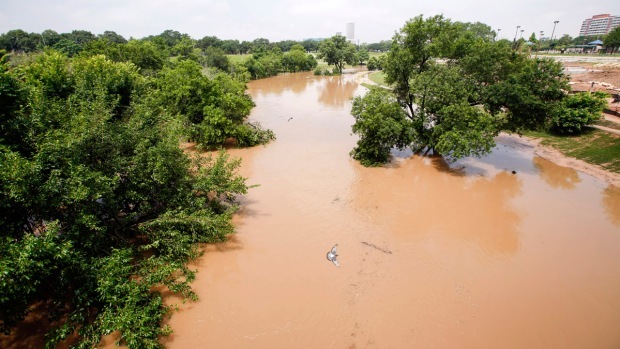 Authorities said the Brazos River in Parker County is rising again due to new rain and the opening of two flood gates upstream at Possum Kingdom Lake. County emergency management spokesman Joel Kertok said Friday that the river had risen above flood stage again after dropping below it Thursday night. On Thursday, water was lapping at the foundations of 11 homes as the river crested at 23.58 feet before dropping to about 20 feet. The flood stage is at 21 feet. The level rose Friday to 21.4 feet and was expected to rise to nearly 27 feet Saturday. Residents of about 250 homes near the river, most in the Horseshoe Bend community, were asked to voluntarily evacuate. "The river is already above flood stage and will continue to rise through today and tomorrow," county emergency management coordinator George Teague said. "This situation will get worse before it gets better." As of 10 a.m., officials reported that 44 flights into Dallas/Fort Worth International Airport had been canceled; 56 arrivals were delayed. Thirteen flights departing from the airport were canceled and 52 more delayed. One of D/FW Airport's runways closed temporarily after a storm drain crews were repairing to address a nearby sinkhole collapsed. Officials said they expect the closure to have minimal impact on flights. Nineteen flights departing from Dallas Love Field were delayed and 19 more canceled. Eighteen flights into the airport were delayed and 18 more canceled. Dallas Love Field also experienced a power outage caused by a surge overnight, according to airport official Jose Torres. Power has since been restored. It was a memorable and historic week for rain and flooding in North Texas, and NBC 5 News worked to bring those stories to you. Take a look back at some of the images from this week.